Some areas have declared a state of emergency, doctors have described it as "a pandemic in progress" and some are even advising women in affected countries to delay getting pregnant. 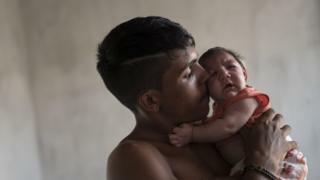 The WHO says there is "scientific consensus" that Zika causes microcephaly as well as Guillain-Barre syndrome. "The virus will not cause infections in a baby that is conceived after the virus is cleared from the blood," it says. "There is currently no evidence that Zika-virus infection poses a risk of birth defects in future pregnancies." Declaring Zika as a "public health emergency of international concern" singles the disease out as a serious global threat. It puts it in the same category of importance as Ebola. The WHO will co-ordinate countries' health agencies to conduct trials to determine the risk. "Its current explosive pandemic re-emergence is, therefore, truly remarkable," the US National Institutes of Health said. "The very, very best scenario" would be a vaccine ready for the general public by the beginning of 2018, they say.